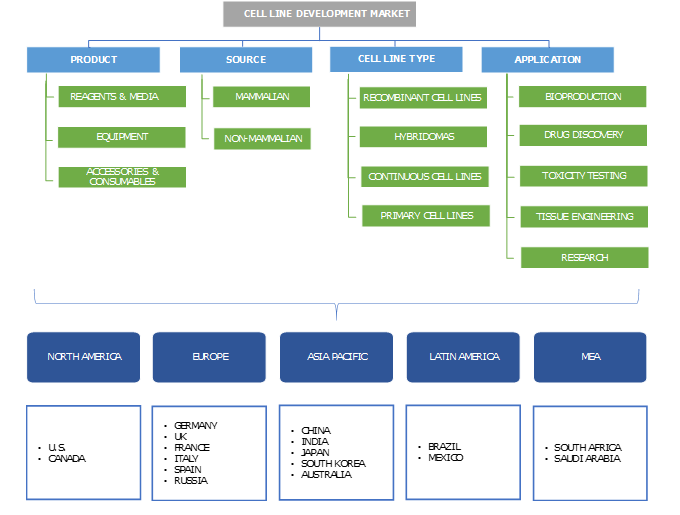 Cell Line Development Market size was valued at USD 3.3 billion in 2017 and is expected to witness over 13.0% CAGR from 2018 to 2024. Increasing prevalence of chronic diseases such as cancer in developed as well as developing countries will render positive impact on cell line development market growth. Cancer is one of the leading causes of morbidity and mortality worldwide. According to American Cancer Association, in 2016, around 1.3 million new cancer cases were recorded in the U.S. leading to rise in demand for vaccines and monoclonal antibodies thereby propelling cell line development business growth. Moreover, growing geriatric population base suffering from chronic diseases will spur the industry growth over the forthcoming years. Technological advancement in cell line development will serve to be another key factor for driving cell line development market growth. Developments in biotechnology industry across the globe has led to advancements in cell culture, drug discovery, gene therapy and other such applications of cell line industry. Government initiatives for improving healthcare sector will further accelerate growth of cell line development industry. However, lack of clear regulatory guidelines as well as issues related to stem cell research may hamper business growth over the analysis period. Reagents and media product segment dominated the cell line development market with USD 1.8 billion revenue in 2017 and is anticipated to dominate the market throughout the analysis period. Reagents and media form major component of cell line development procedures. Wide adoption of reagents and media in drug discovery, bioproduction, toxicity testing as well as tissue engineering will drive segment growth over the forecast timeframe. Equipment product segment is estimated to witness more than 13.0% CAGR during the analysis timeframe. Developments in cell line development technologies is major factor that will boost the segment growth. With increasing usage of bioreactors, centrifuges, incubators and other equipment for cell line production coupled with ongoing research and development activities, equipment segment is forecasted to play vital role in the cell line development market growth. Mammalian source segment accounted for USD 2.4 billion revenue in 2017 and will show similar growth throughout the analysis period. Adoption of mammalian cells for producing complex biotherapeutic proteins has increased singificantly in recent years. Mammalian cells cultures are used for producing vaccines for mumps, rubella and other diseases. Rising prevalence of infectious diseases worldwide will drive segment growth during the forecast period. Non-mammalian source segment will witness around 12.7% CAGR during the analysis period. Non-mammalian cell cultures are used in various research fields such as insecticide screening, enzymatic activity assay as well as toxicity testing. Non-mammalian cell cultures include plant cell cultures, insect cell cultures as well as bacterial yeast cultures. Increasing adoption of these cultures in cell line development research will augment the segment growth. Recombinant cell lines segment dominated the cell line development market with 31.1% market share in 2017. Wide adoption of recombinant cell lines in vaccine and monoclonal antibodies production as well as in gene therapy will fuel demand for recombinant cell lines. Huge investments in R&D for drug discovery will further surge the demand over the forecast timeframe. Hybridomas segment is projected to show 13.3% CAGR during the forecast period. Hybridomas technology is primarily used for large scale production of monoclonal antibodies. Demand for products developed using hybridoma technology to improve quality of life in patients suffering from cancer, anti-inflammatory disorders and autoimmune diseases is increasing. Rising demand for monoclonal antibodies for disease treatment will upsurge the hybridomas segment growth. Bioproduction segment accounted for USD 1.5 billion in 2017 and is estimated to dominate the industry throughout the analysis period. Increasing demand for biological products such as peptides, enzymes, monoclonal antibodies as well as therapeutic proteins will foster the segment growth. Technological advancements resulting in development of superior techniques for bioproduction will further augment the segmental growth. Tissue engineering segment is forecasted to witness 14.2% CAGR over the analysis timeframe. Wide applications of tissue engineering in development of biological substitutes to restore, maintain and improve damaged tissues is the major driver for segment growth. Growing adoption of tissue engineering in patient treatments such as skin grafts, implantation of bladders, trachea, small arteries, and cartilage will foster the segmental growth in the foreseeable future. North America cell line development market accounted for USD 1.1 billion revenue in 2017 and is projected to witness similar trend over the forecast period. Rising incidences of infectious and lifestyle disorders coupled with favourable demographic trends such as aging population will drive the industry growth. Availability of superior technologies that are essential for generating robust and highly productive cell lines for large scale protein therapeutic production, will further accelerate the regional growth. Asia Pacific cell line development market is estimated to show 14.2% CAGR from 2018 to 2024. Rapidly growing disease burden including cancer in developing economies such as India and China will drive the regional growth. Adoption of advanced cell line development techniques in biopharmaceutical industries, increasing patient demand for advanced biological drugs due to rising healthcare affordability will upsurge the regional growth throughout the forecast period. Some of the key players operating in global cell line development market are GE Healthcare, Thermo Fisher Scientific, Lonza Group, Sigma-Aldrich Corporation, Wuxi AppTec, Sartorius Stedim Biotech, Corning, Selexis, Vista Biologics, EuBiologics, Paragon Bioservices, Cobra Biologics, Patheon, Samsung Biologics, Epistem Holdings, Catalent, Bioceros, Abzena, Promocell and Cyagen. Key industry players are primarily focusing on partnerships, mergers, acquisitions and new product launch to enhance existing product portfolio as well as maintain their market position. For instance, in May 2015, Thermo Fisher Scientific signed a commercialization and supply agreement with Horizon Discovery Group, to market Horizon’s X-MAN cell line collection and broaden company’s customer base. Cell line development market is the rapidly growing segment of the biotechnology industry. The market is well established in developed economies. The industry will witness robust growth in the coming years due to increasing cancer burden worldwide. Development of technologically advanced products in biotechnology industry coupled with huge investments in research and development activities should drive the cell line development industry growth. Bioproduction currently represents largest segment in the industry while drug discovery and tissue engineering are amongst the fastest growing application segments. Industry players are engaged in development of better cell line products to garner higher revenue shares. Advancement in existing technologies and rising demand for vaccines and monoclonal antibodies will offer promising growth opportunities in near future.